Situated in a lagoon on Italy’s northeastern Adriatic Coast, Venice is one of the most beautiful romantic and best-loved cities in the world. This truly unique city–a maze of waterways, walkways, narrow streets and small squares– is built on approximately 117 islets, which are separated by 177 canals and spanned by some 400 bridges. The buildings are supported by literally millions of poles driven into the marshy sediment. A 3-miles (4.8-kilometer) bridge reaches across the lagoon connecting Venice to the mainland, while a narrow sandbar, the famous Lido, forms a natural breakwater that protects Venice from the force of the Adriatic Sea. There are, of course, no cars or buses in the main city and transport for visitor or Venetian alike is on foot, by vaporetto (water bus) private launch, water taxi or the traditional, graceful gondola. Venice was the home of Marco Polo and later in history Casanova, who was imprisoned here. Many famous people have visited Venice including kings, queens, emperors and popes. Lord Byron, Charles Dickens, Puskin, Mark Twain, Henry James and Emest Hemingway, among others, all stayed in Venice. Vivaldi worked here as a concert master and Richard Wagner stayed in Venice while composing “Tristan and Isolde.” Numerous artists and writers have immortalized its charmed beauty. Today tourism is a very important industry for the city, followed by maritime and port services. Piazza San Marco (St. Mark’s Square) is the center of life in Venice, a popular meeting place where visitors can stroll, listen to the musicians outside the coffee houses, browse in the shops in the Piazza’s arcades, or feed the large numbers of pigeons that congregate there. Near the center of St. Mark’s Square is a copy of the original 9th-century bell tower, which collapsed in 1902. An elevator will take you to the top for magnificent views. The clock tower, across from the bell tower, was built in 1499 by Mauro Coducci. Giant Moors strike the hour on the great bell. There is also a zodiac clock on the tower, showing the time in Arabic and Roman numerals. St. Mark’s Basilica is truly a masterpiece of Byzantine architecture. Built in 830,it was originally a chapel for the Doges. The present Basilica dates from the 11th century and contains some magnificent mosaics, precious art and rare marbles. Palazzo Ducale (Doge’s Palace), situated next to the Basilica, was both the residence of the Doge and the seat of government. The finest room in the palace is the grand Council Chamber, containing paintings by Tintoretto and Veronese. 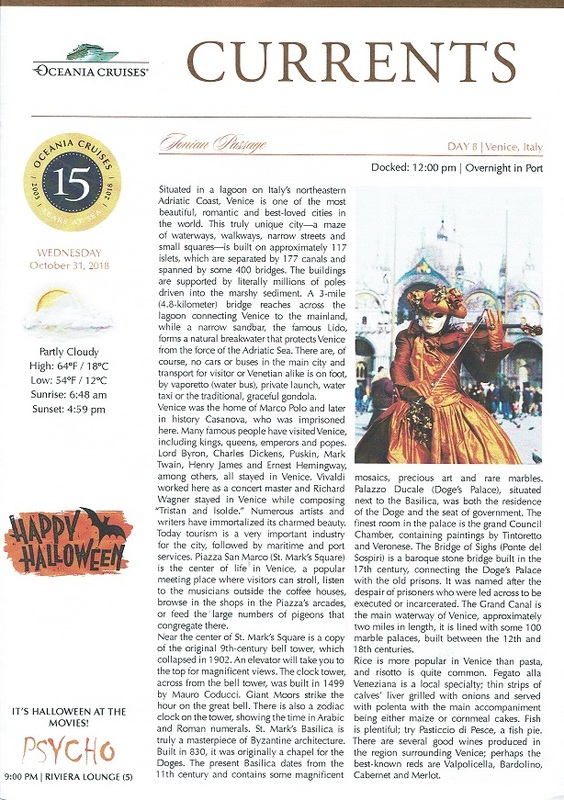 The Bridge of Sighs (Ponte del Sospiri) is a baroque stone bridge built in the 17th, century connecting the Doge’s Palace with the old prisons. It was named after the despair of prisoners who were led across to be executed or incarcerated. The Grand Canal is the main waterway of Venice, approximately two miles in length, it is lined with some 100 marble palaces, built between the 12th and 18th centuries. Rice is more popular in Venice than pasta, and risotto is quite common. Fegato alla Veneziana is a local specialty; thin strips of calves’ liver grilled with onions and served with polenta with the main accompaniment being either maize or cornmeal cakes. Fish is plentiful; try Pasticcio di Pesce, a fish pie. There are several good wines produced in the region surrounding Venice; perhaps the best-known reds are Valpolicella, Bardolino, Cabernet and Merlot. Today in Venice guests may use complimentary shuttle buses provided by the local port authority to reach the water taxi station. The shuttle buses will run continuously from the terminal, beginning at 12:30 pm with the last shuttle returning to the ship at 10:30 pm. Shuttle buses are operated on a first come, first served basis, and may depart earlier than scheduled if filled to full capacity. This service should not be considered as an alternative to available local transportation such as taxis but rather as a supplement. Interval between shuttles is approximate and Oceania Cruises are not liable for any unforeseen delays or changes to the shuttle schedule. Guests who prefer not to wait for a shuttle may wish to secure a taxi at their own expense. No compensation is due for non use of this complimentary service or if alternative forms of transportation are used. Please note, shuttle buses are not wheelchair accessible.